Improbable Providence Subway Map by Transit Authority Figures. 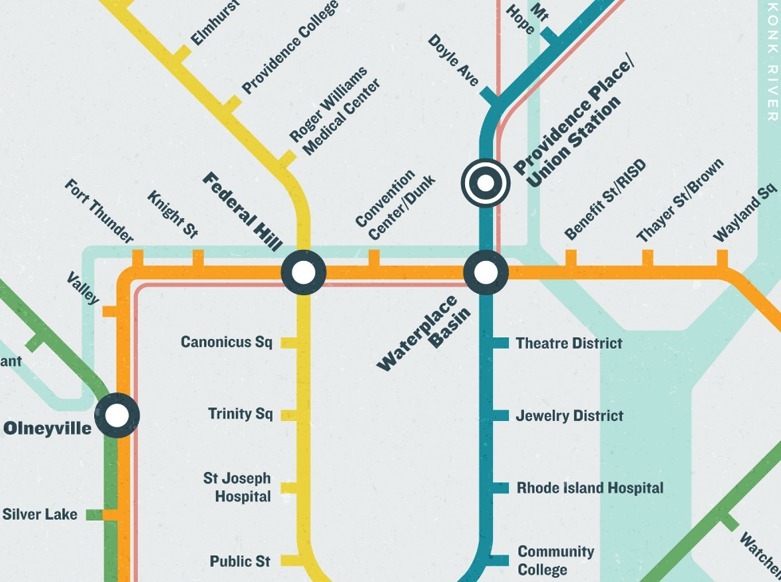 The Improbable Providence Subway Map we looked at a few months ago is complete and ready for purchase. Check it out at Transit Authority Figures. And if you’re a local retailer carrying the map, let us know and we’ll update this post. Shop local! I’d make some adjustments but otherwise this is visionary. Screw spending millions and billions on highways, build this! I got my map in the mail yesterday, it is awesome. As soon as I get a frame it is going up with my Cape Cod one. I hear they may be available at Frog & Toad on Hope Street. The subway needs to reach the beach. The Map Center on North Main Street carries The Improbable Providence Subway Map. I regularly see bus passengers coming in to ask about it. Even though they know it can not possibly be for real, they seem compelled to ask anyway, just in case.